Today I am back with the rest of the Freak Show Polish collection! I have four more gorgeous glitters to swatch and review. I started off with Lion Tamer. I used Julep Donna for the undercoat and topped it with Lion Tamer to show off the gold and red glitters. On the accent finger is a little acrylic painted lion. I am seeing with Freak Show Polishes that they have absolutely NO problems with glitters laying flat! What a relief! I was worried when I saw the stars that I'd have problems with the glitters pulling up but they laid nicely against my nail and stayed looking pretty. I had to fish a few stars out but I find with any polish that has glitters stars I always need to do a bit of fishing. It's unavoidable because they are so big and heavy! 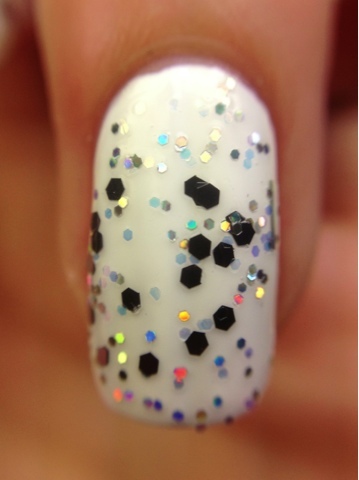 In the macro you can see how harmonious these glitters are together in this polish! For the macro you can see some holo shine on these glitters and they really do pick up the light and reflect vividly. The stars are in there! They just tend to get hidden amongst the smaller shapes. 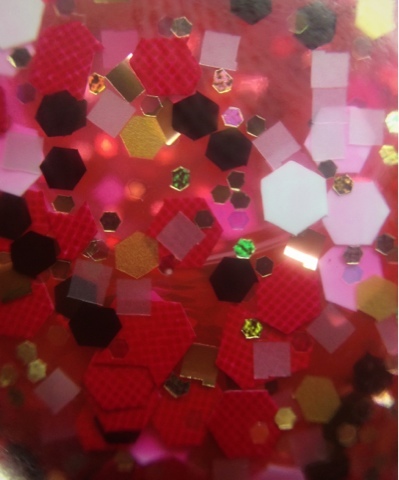 Here is what Freak Show Polish has to say about Lion Tamer: "Inspired by the people daring enough to take on the king of the jungle, Lion Tamer is a glitter top coat full of gold squares, slices and hexes as well as red hexes and stars." Rawr! I was super excited to try Sword Swallower! This polish has a strong collection of silver holo glitters in bars and hexs that reflects rainbows everywhere! It also includes translucent and black hex glitters. The light is picked up in the holo and translucence while it is sucked back up again by the black glitters. It is a really great effect. I used Essie Blanc as a base because I wanted to reflect as much light as possible to the holo glitters. See that gorgeous rainbow of colors on the pinky bars? You get that all over with subtle shifts of your hand in the light! The macro shot of Sword Swallower really shows off the rainbow best. You have a full spectrum of colors here. 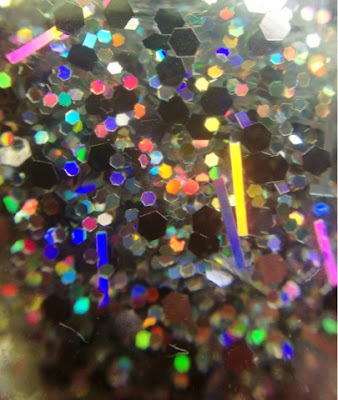 This glitter would look gorgeous over anythinggggg. Here is Freak Show Polishes description: "Inspired by one of the more daring acts of the circus, Sword Swallower is a top coat glitter polish packed full of silver, gray, and holographic hexes and slices." Sign me up to duel this guy anytime. Snake Lady in the bottle gave me the impression of snake scales so I decided to try and create my own snake scales on my fingertips. I used OPI DS Illuminate as the base and did two coats of Snake Lady on top. This glitter has black glitters, large whites and medium browns. And don't forget the signature translucent glitters hidden in there. I really see speckled snake scales when I look at this mani! I love this combo! The glitter went on great and gave me the exact look I was aiming for. 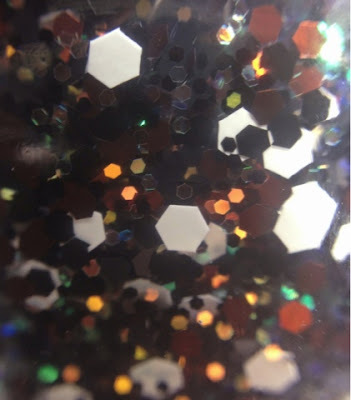 I read Freak Show Polishes description after I came up with my scale-er-ific mani idea and it appears we are on the same page with this glitter, "Snake Lady is a top coat glitter polish with brown, black and white hexes in various sizes created to give a reptilian look to your manicure." Exsssselent! I saved my personal favorite for last. Bringing up the rear of the parade is Ringmaster! 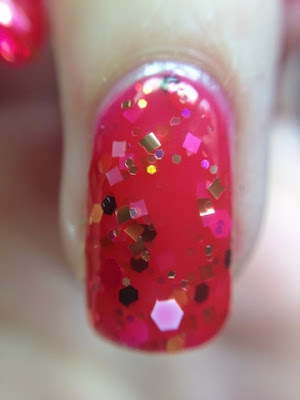 Ringmaster is a light red translucent base with gold, black, yellow, red and white glitters somehow all fit into one bottle! The base on this polish is fan-freaking-tastic. The red coats your nail to opacity and gives you an instant jelly sandwich. The base pigment is a bright red that really adds some flare to your nails. 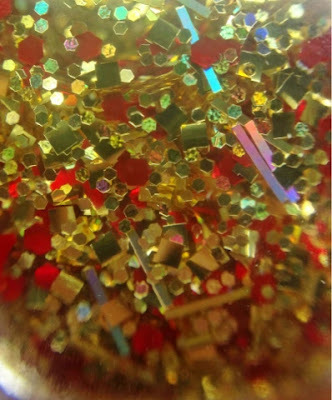 Of course not only are all the glitters above included but Freak Show Polishes translucent glitters are sprinkled in as well! I find these really round out her formulas well to give all of her polishes a wonderful, full effect. Upon closer inspection I was surprised to find that the large red glitters are textured! See that criss cross pattern on them? How complex can one nail polish get? What a wonderful surprise! Freak Show Polish sounds equally excited about Ringmaster: "The Ringmaster of a circus is front and center. This polish, inspired by its namesake, features a red jelly base with gold squares and black, white, yellow, and red hexes." Ladies and gentlemen, boys and girls the gorgeous Ringmaster! 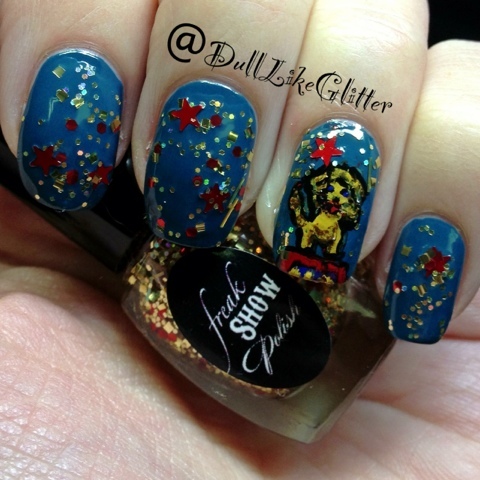 Overall Freak Show Polishes entire collection was wonderfully made. The base suspended all these glitters, sometimes large heavy ones, perfectly well. All of them spread the glitters evenly over the nail and had a great variety to them. There is a through thought to all of these polishes and they clearly belong in one, big, freaky, happy family. The pigmented jelly based polishes did exactly what they were suposed to and the clear based glitters perfectly accentuated my manicures. My must haves of this collection for me are Ringmaster because of the amazing complex awesomeness of it, Sword Swallower for its lovely holographic glitters, Circus Elephant for its fun glitter colors offset by the dark base and Snake Lady for its purely reptilian poise. Lion Tamer, Mime, Cotton Candy and Fire Eater were all fabulous glitters as well, I'm just purely picking out my own personal faves. You won't miss with any of these polishes! 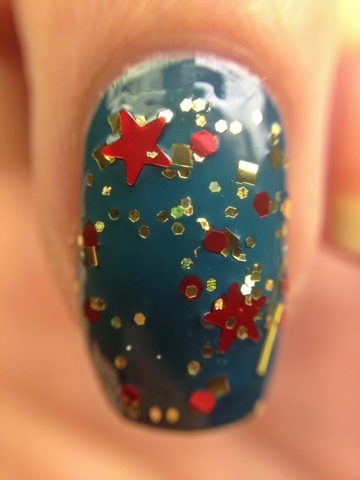 Here is Freak Show Polishes site. You can also find her on Facebook and Instagram @freakshowpolish. Be sure to watch for her upcoming six new polishes which are to be released the first week of December. I know like an elephant, I'll never forget! This polish was sent for review and is based on my individual, honest opinion! oh I love Sword Swallower! And your lion is adorable I love it! Butter London Black Friday Deal! Ugly Holiday Sweater Nail Art Contest!